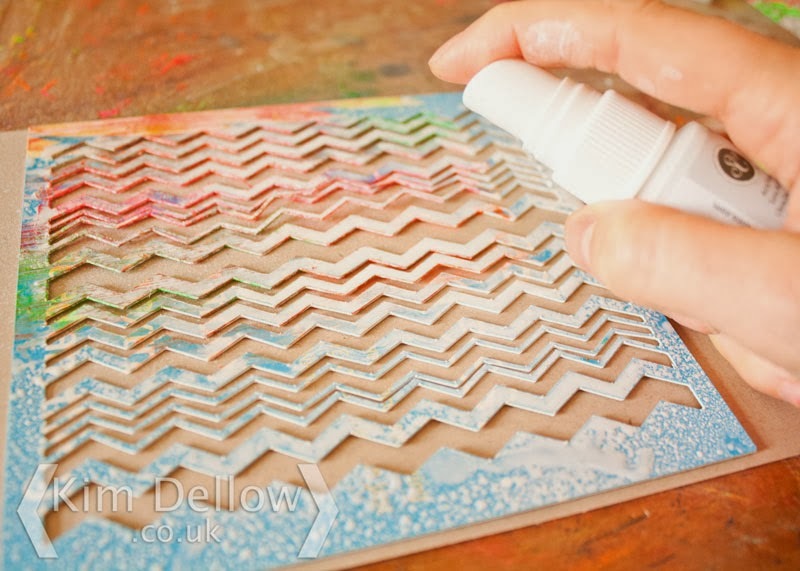 Welcome to the last part of my chevron-inspired series of September Silhouette Cameo tutorials. I feel like I should have a jingle! Ok so I have no jingle but I do have plenty of chevrons! Last week, in Part 3, I left you with some zigzags made from the chevrons in my first tutorial in the first week in September. So what did I do with them? Well first off I made some more of them. 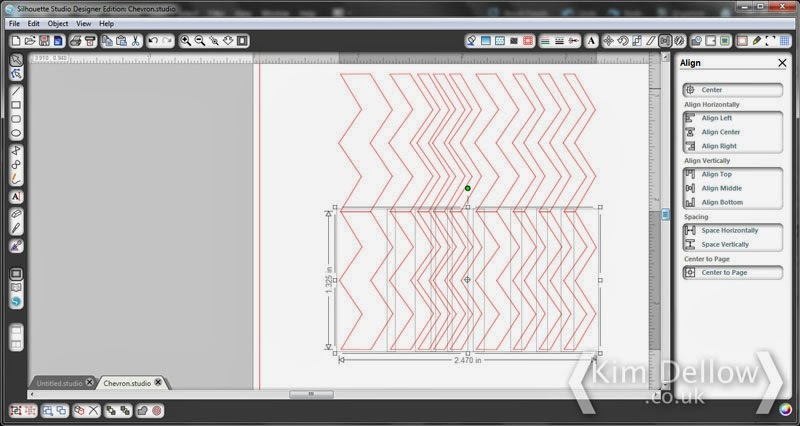 Using the tutorial in Part 3 I filled my 6 x 6 inch work space with zigzags then I used the Rectangle tool to draw around the zigzags. Next I thought I would make a mask so I decided to cut the zigzags from a cereal box. I used masking tape to make sure the cereal box wouldn’t move and set it to the Coverstock – Heavy – 285 gsm setting which gives you a speed of 1 and tells you to set the blade to 7. 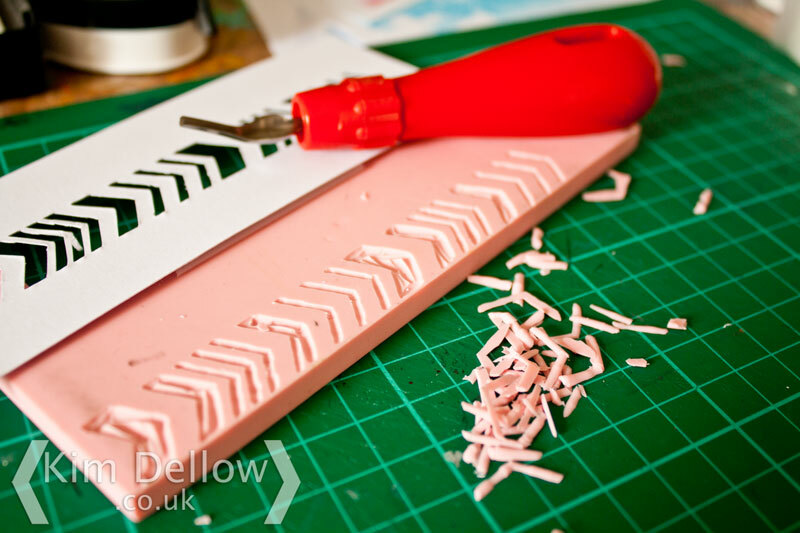 So that is is idea number one, the next use for my zigzags was to cut them from patterned papers. 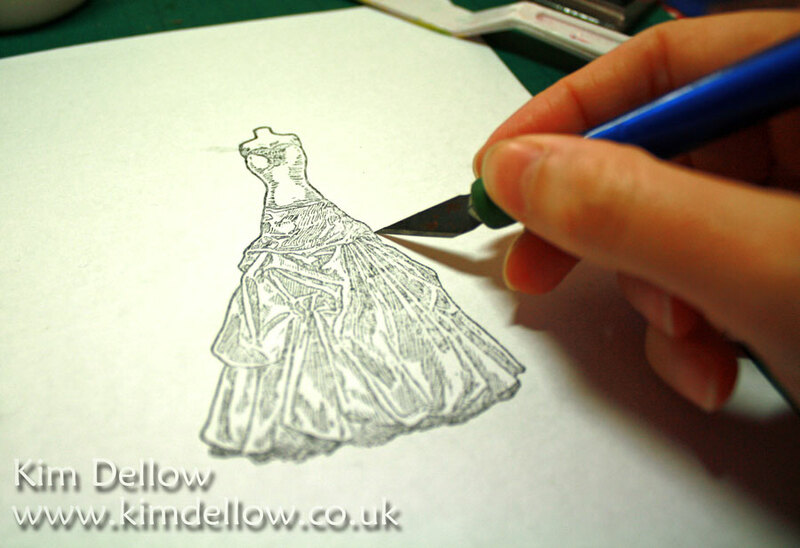 This time I used the Patterned paper – medium weight 180 gsm setting and reset my blade to 3. I also cut several strips of paper next to each other to get different zigzags in different papers using just one run through the Silhouette Cameo. I then went back to the zigzag cereal box mask to use it with paints this time. 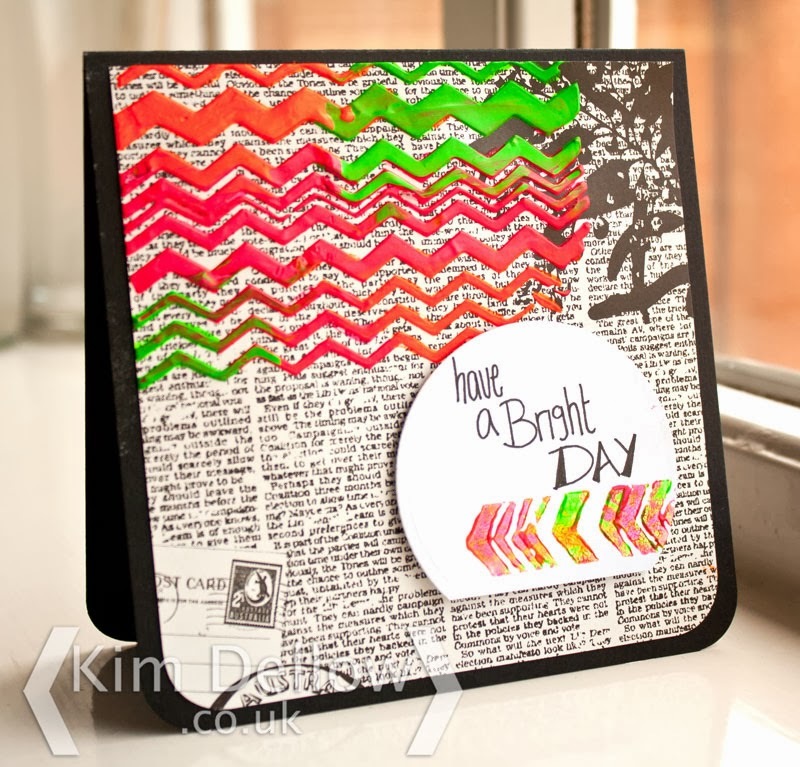 Thanks for joining me in this month of Chevron inspiration with the Silhouette Cameo. 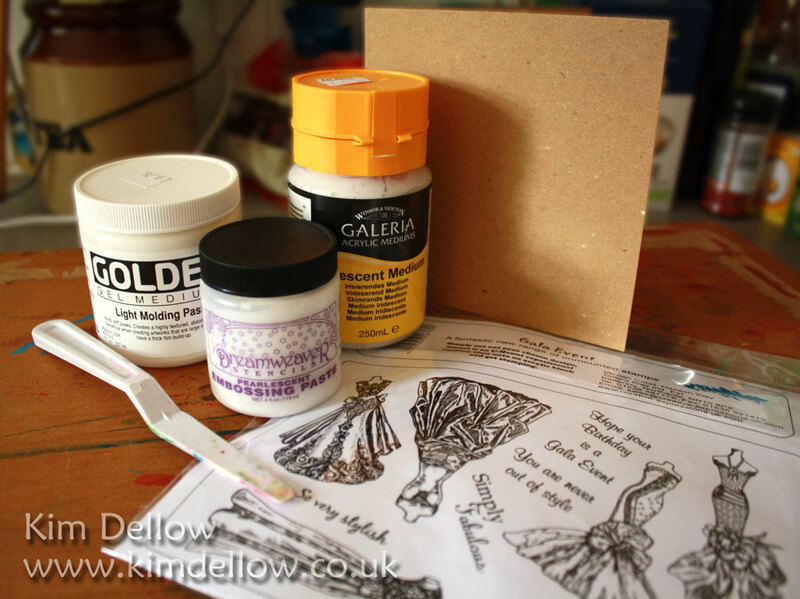 Welcome to the third instalment to my chevron-inspired series of Silhouette Cameo tutorials. 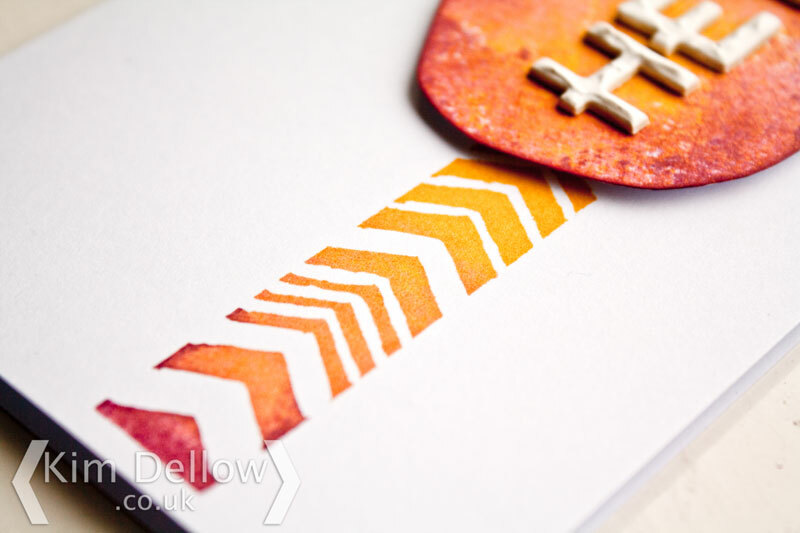 Last week I used my Silhouette Studio designed chevrons to make my own carved stamps. 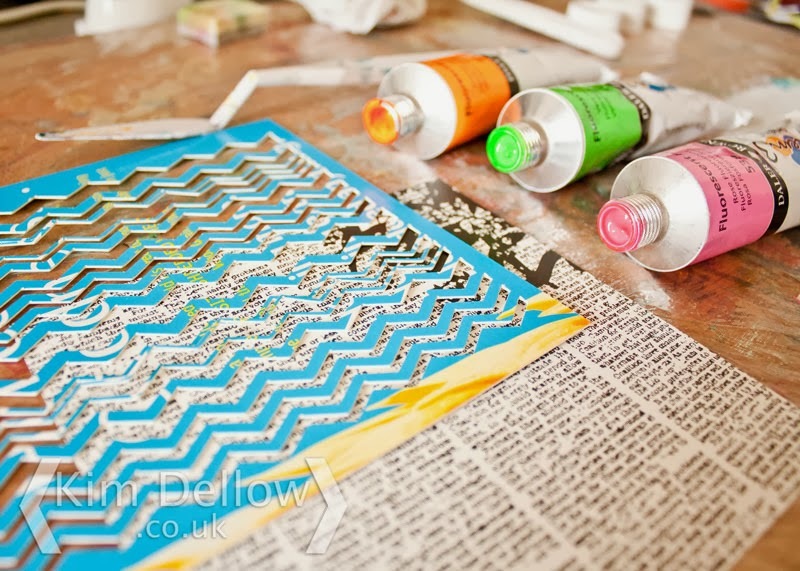 This week I thought I would show you how to make some zig zag patterns from the chevron designs. You remember don’t you? This is my basic pattern that I’ve been using for all the Chevron projects and I showed you how to make it in the first week. 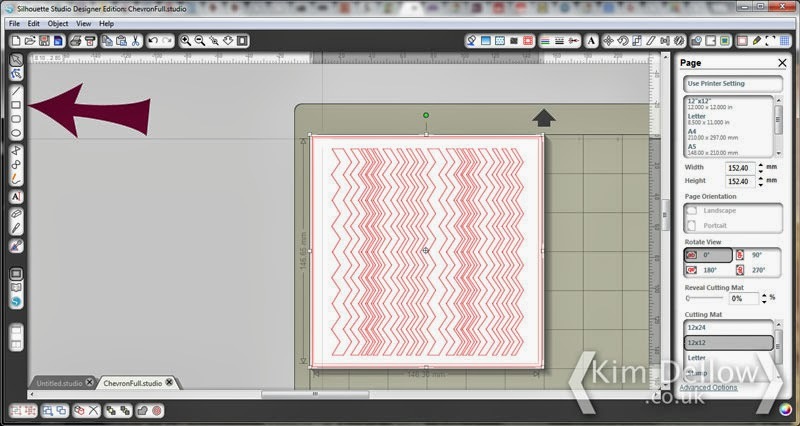 Using this pattern again, select all the chevrons and use the Align Bottom tool before duplicating them using the drop down menu in the Edit Tools or the ctrl-D shortcut. 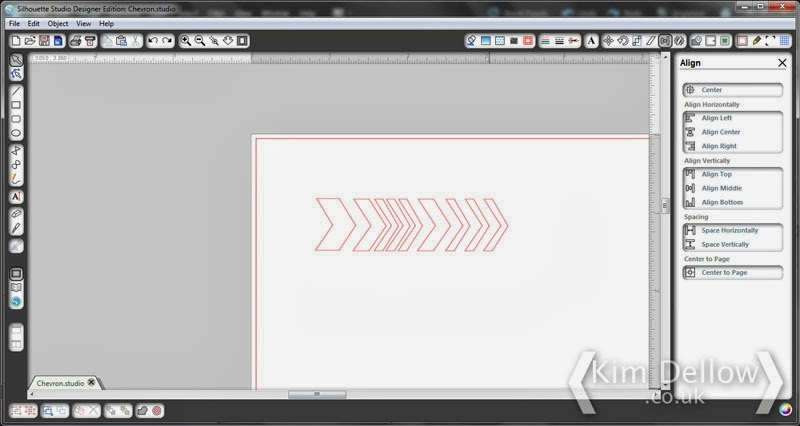 Move the duplicate chevrons so that they sit exactly over the original chevron pattern, then use the Flip Vertically tool in the Transform menu in the Object drop down menu. 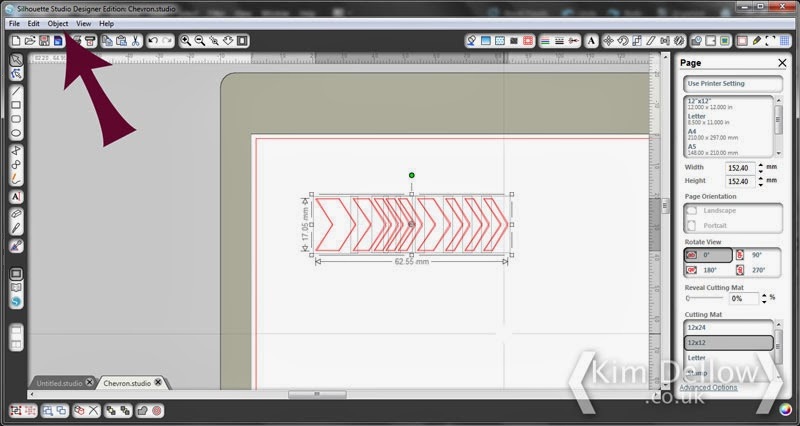 Tip: Don’t forget to do the Align step before duplicating the chevrons. Now move the duplicate chevrons down until the tops of the duplicate chevrons are lined up perfectly with the bottom of the original chevrons. to get some not-so-instant Zig Zags! Yay! Wahoo! We have Zig Zags! 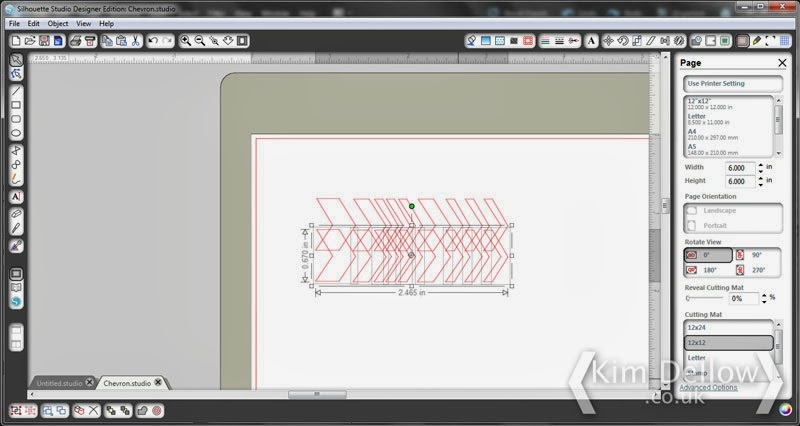 Tip: If the selected shapes don’t merge try deselecting then, select only the duplicate chevrons and move them up very slightly, then reselect all the chevrons and try to weld again. Keep repeating this process until the shapes are near enough to weld together. Is that more Zig Zags? 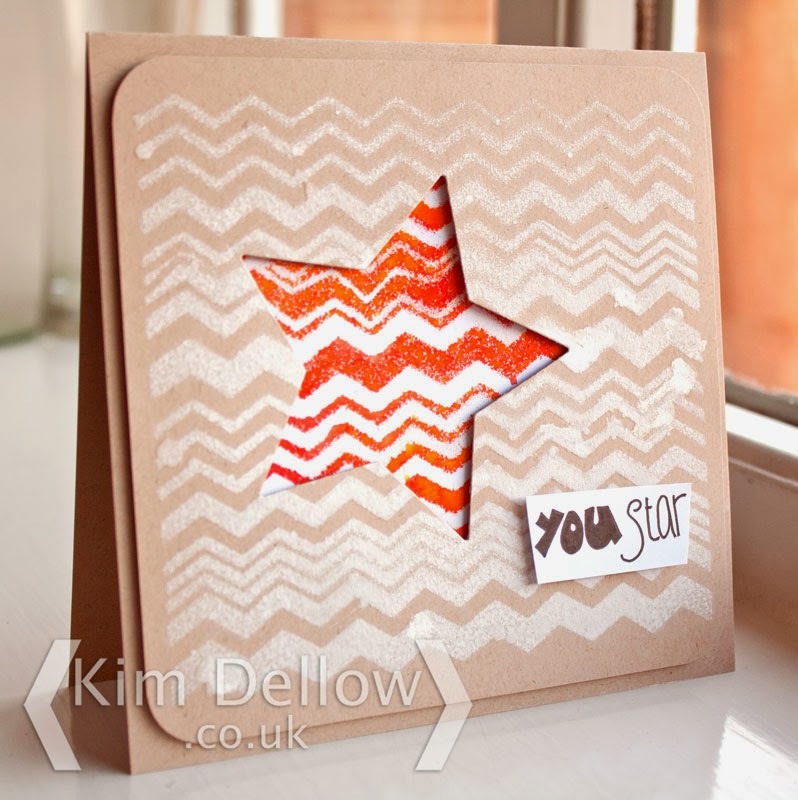 Catch you next week for the last Chevron instalment for the Silhouette Cameo, and to see what I did with these Zig Zags! 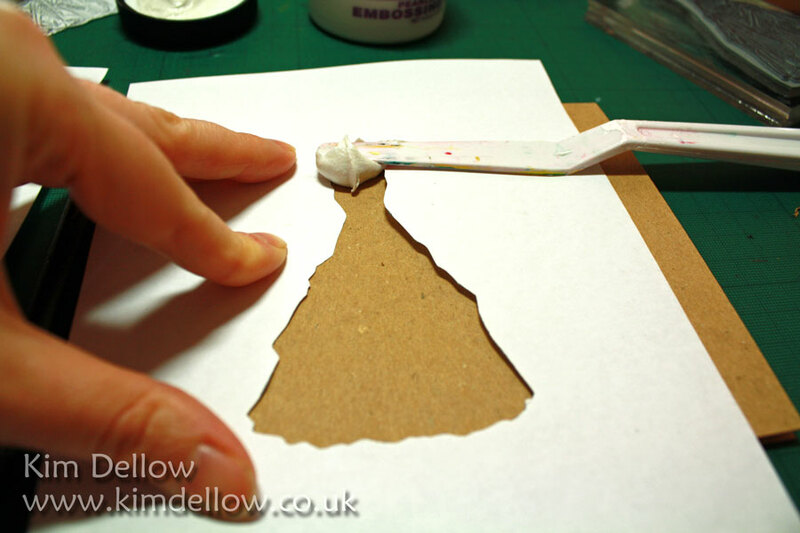 Welcome to the second instalment to my chevron-inspired series of Silhouette Cameo tutorials. 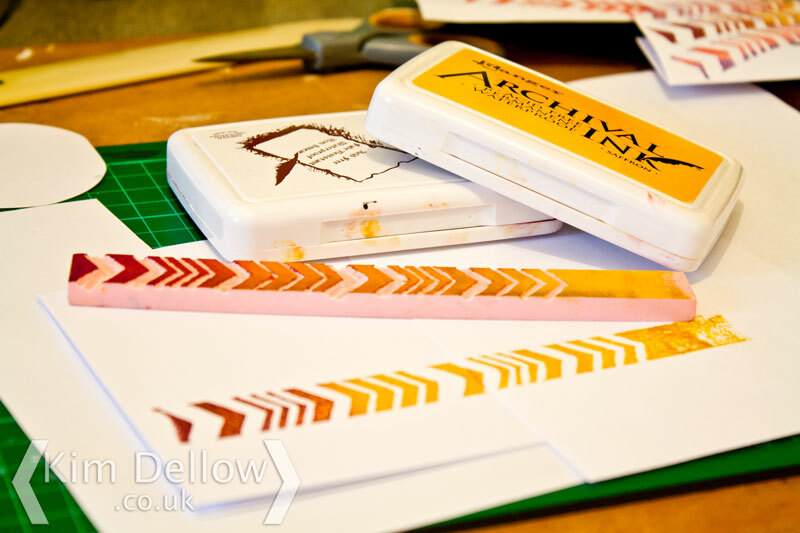 If you remember last week I designed some chevrons in the Silhouette Studio, this week I thought we could do something with the chevrons, so how about some stamp making? I’m really excited to see that the stamp-making material to use with your Silhouette Cutting Machines has reached these shores. 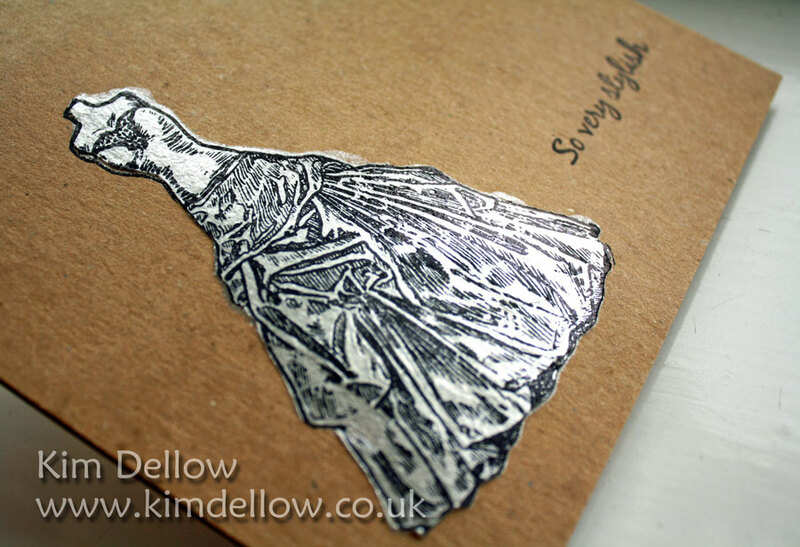 Making stamps with the Silhouette Cameo has been on my wish list for a while. 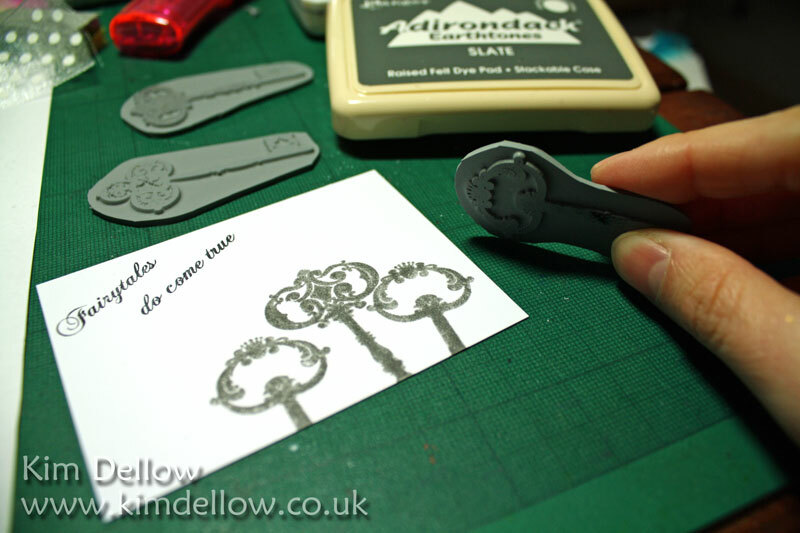 I haven’t managed to get my hands on one of the Silhouette Stamping making kits yet but as I love carving my own stamps I thought I would use my chevrons from last week to make some hand-carved stamps. So to pick up from where we left off. If you remember we had designed a small row of chevrons, select all of them and duplicate them. 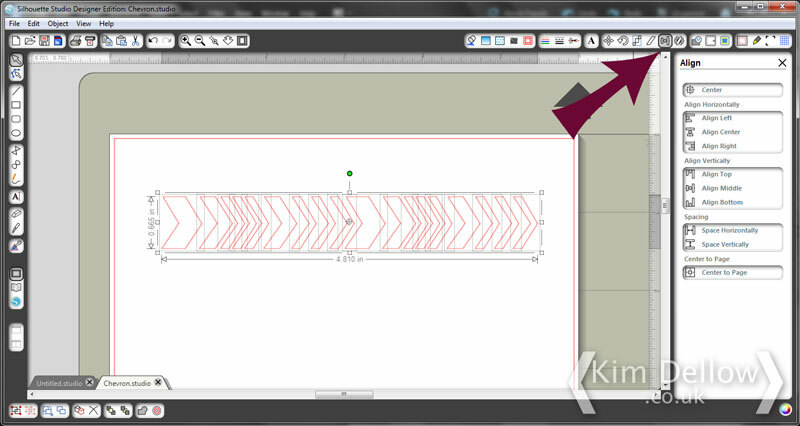 Move the new chevrons to the right-hand side and re-select all of the chevrons, then align the tops with the Align Tool. 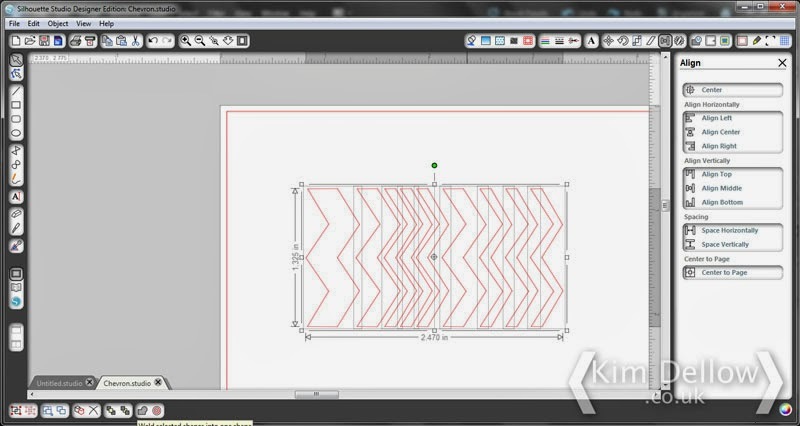 Now use the Rectangle Tool to draw a large rectangle around the chevrons and cut. 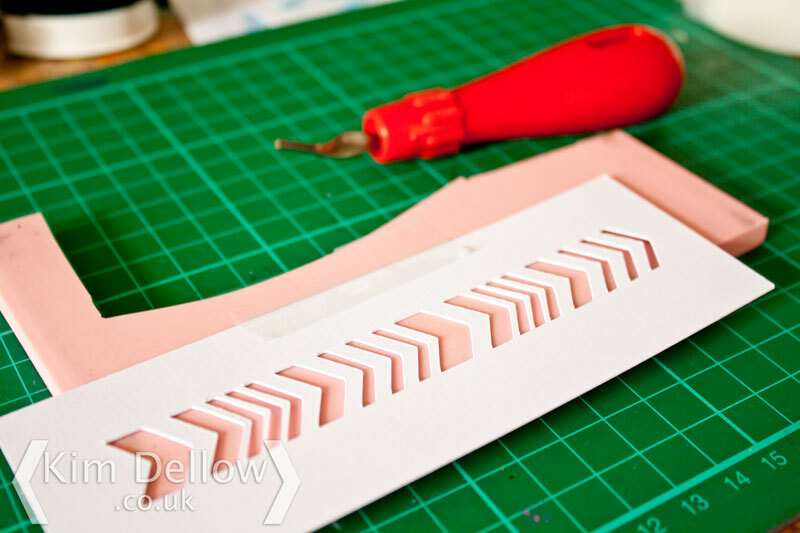 I’ve cut my shapes from 250gsm card to make a template for my hand carving. 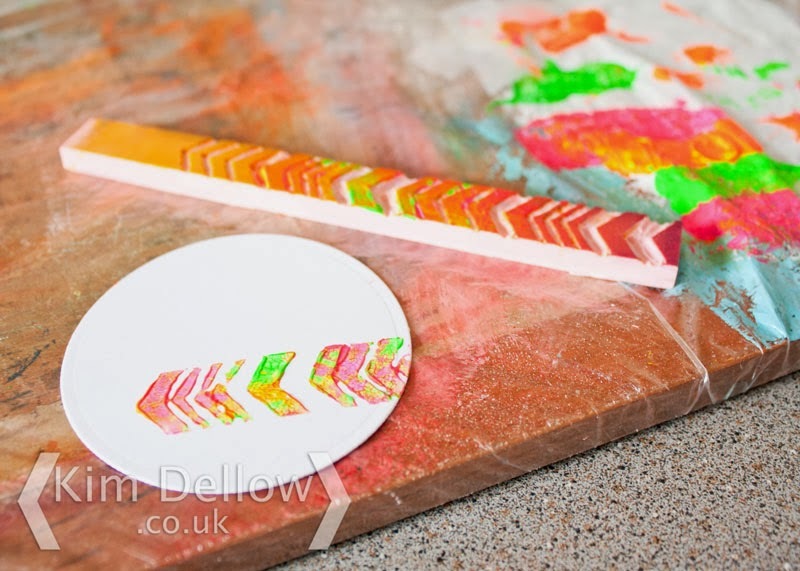 Stick it onto the stamp carving block with some masking tape or Scotch tape and carefully start carving using the template to guide the knife. You will need a delicate hand for some of the thinner shapes but patience and a steady hand will win out! 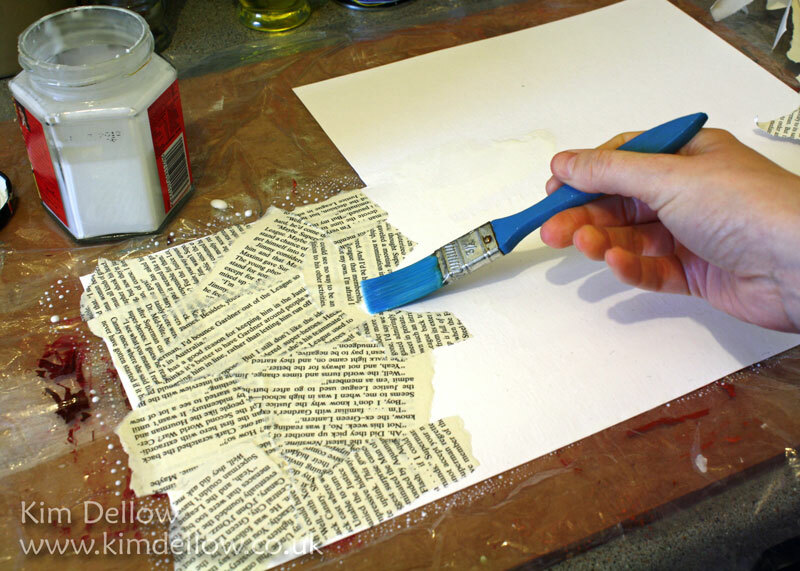 Trim the stamp and ink it up to test it on paper and then remove any bits that you don’t want showing. So there you are: a hand-carved chevron stamp to use again and again made with your Silhouette Studio and Silhouette cutting machine. 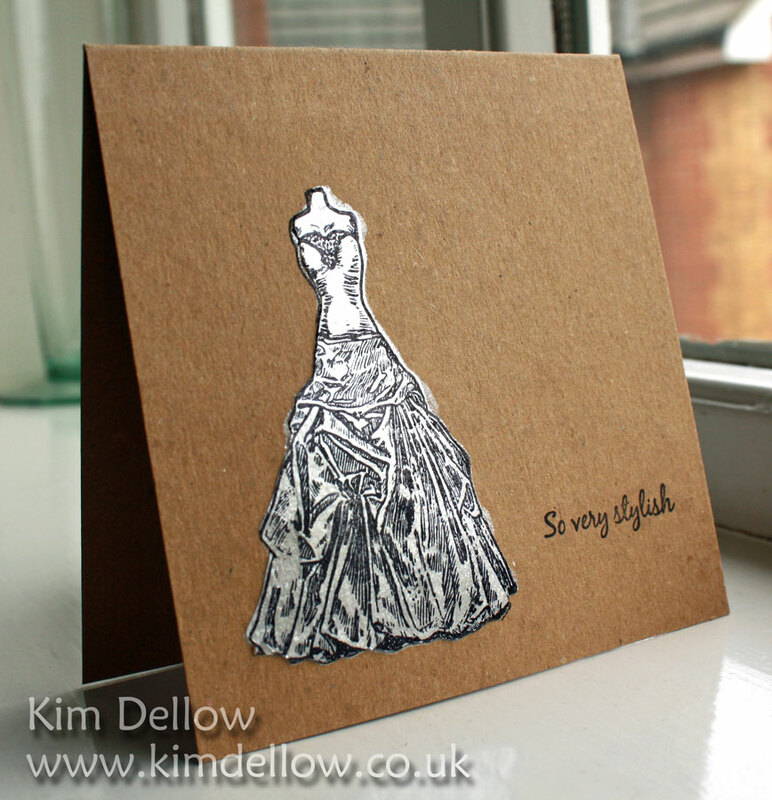 Join me next week for some more Silhouette and Chevron fun. Is the chevron trend over? 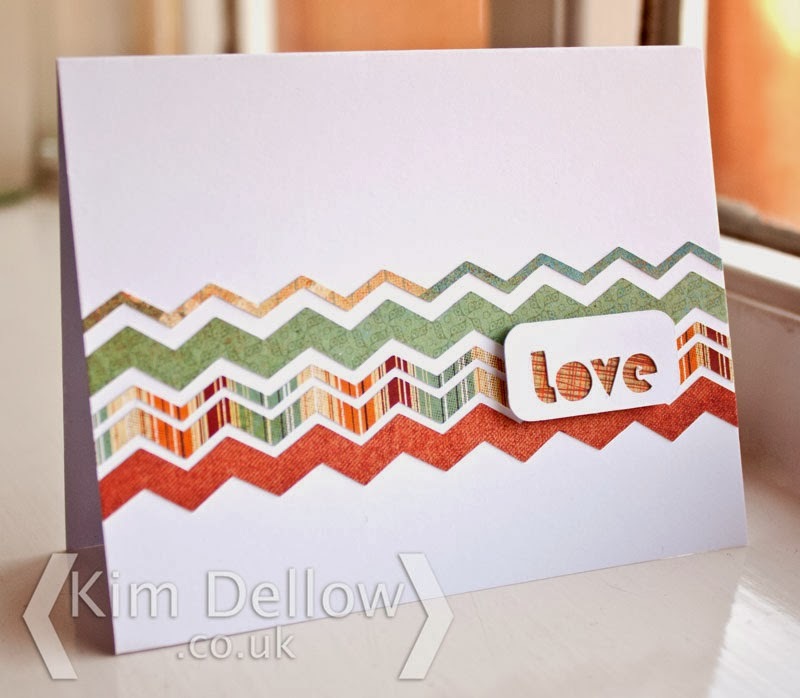 I certainly hope not ‘coz I am still obsessed with them, so much so that I thought I would share some of my chevron love with you guys in this series of tutorials and inspiration using the the Silhouette Cameo over the next few weeks. So who is up for some chevron designing? Now these aren’t going to be the most perfectly geometrical chevrons you have seen, I wanted some chevrons with a bit of personality. The first thing I like to do is to change the size of my mat to the size of my project, which for this is 6 by 6 inch. But you don’t have to if you are happy working in the default size. 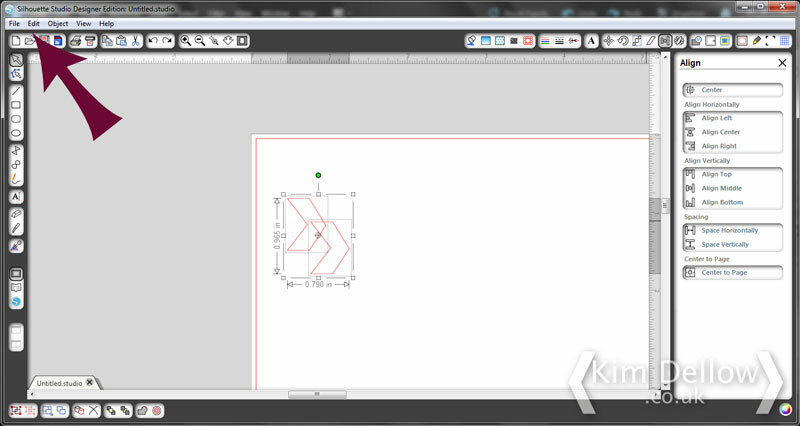 Then use the Draw A Polygon Tool to draw your first chevron shape. 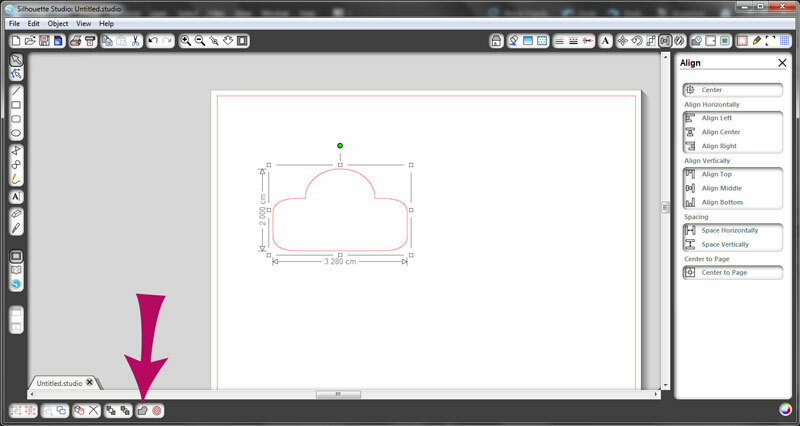 Next, click the Edit Points Tool and change the shape if you need to. I straightened my top line just a smidgen. 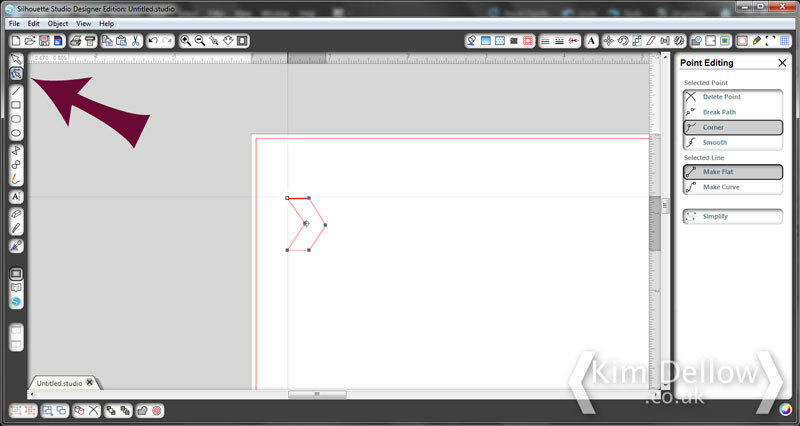 Then select and duplicate the shape either via the Edit drop down or with the ctrl-D shortcut and align the top edges and move the duplicate shape to the right of the original shape. 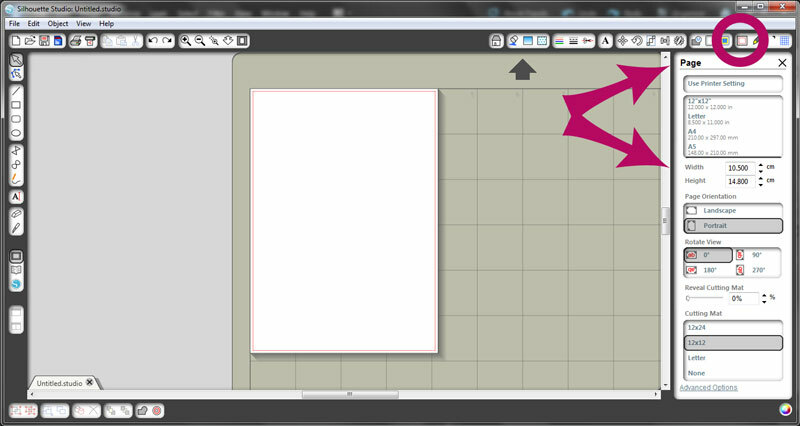 You can use the Edit Points Tool again to change the lines of the shapes if you need to then move the duplicate shape away from the first one. You can keep duplicating and reshaping to your heart’s content. And there you have some chevrons. Come back next week for Part Two in my Silhouette Cameo September Chevrons Series. 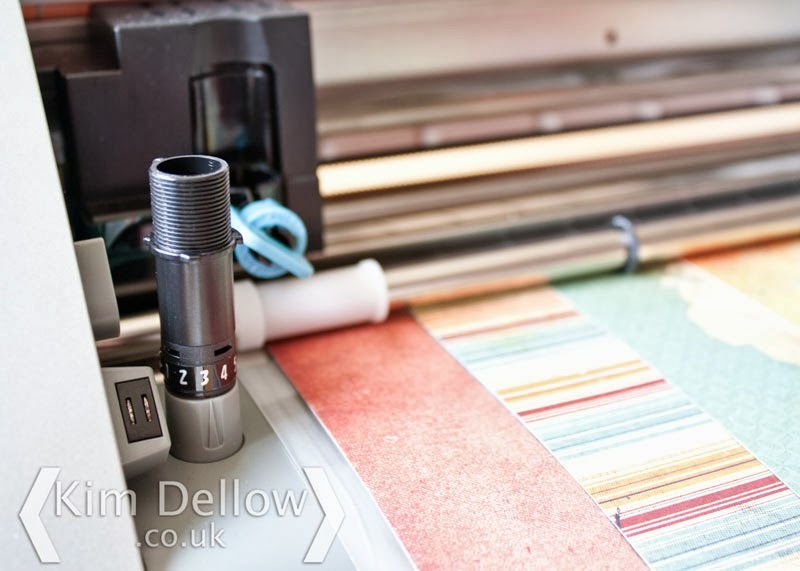 I have a tutorial for you today, one in my Electronic Cutting Machine series sharing some things that I’ve leant using the Silhouette Cameo. One of the best things about the Silhouette machines is that you get so much flexibility and creative freedom even with the free basic Silhouette Studio software. I know you can buy lots of lovely hearts in the online Silhouette shop but I do like a bit of making things for myself! To start you need to draw an ellipse, I’ve made my workspace mat the same size as my card blank to give me an idea of the size I want the heart to be. 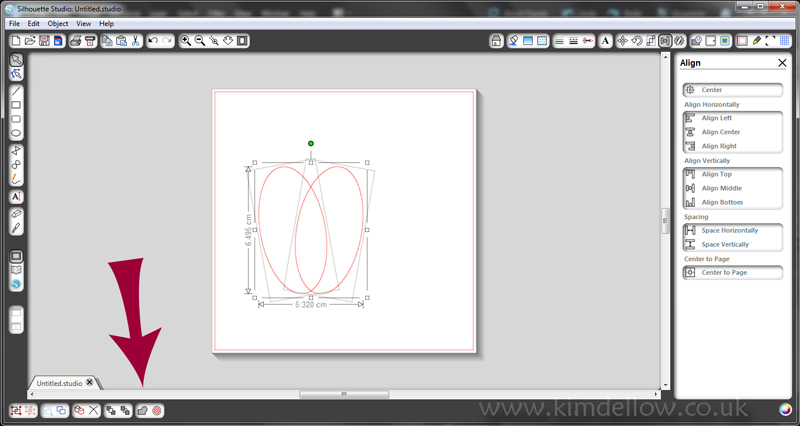 Then copy and paste the ellipse and select both ellipses and use the align tool and align centre to line up the two shapes. I then deselected the left-hand ellipse and moved the right one a smidgen (technical term) to the right. 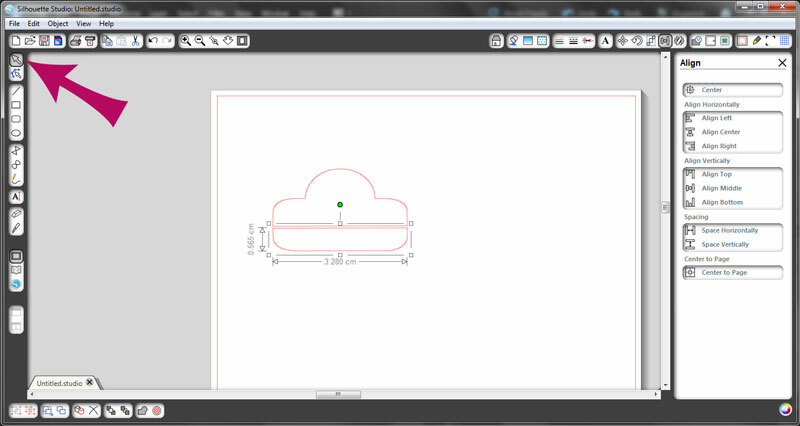 The next step is to slightly rotate each ellipse, the left one to the left and right to the right then select both of them and weld them into one shape. You can see the heart starting to take shape. 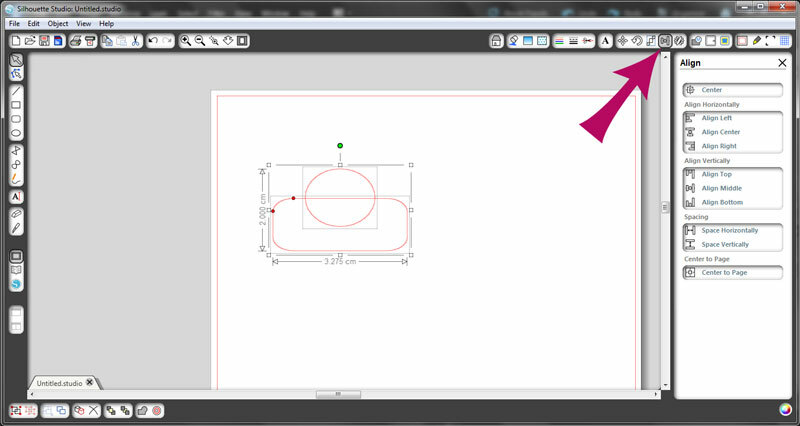 Now you need to select the Edit Points tool and start to move the points until you are happy with the shape. I started with the bottom point of the heart, I moved the points then smoothed the line using the path nodes (the grey points that appear either side of the main point when you select it). 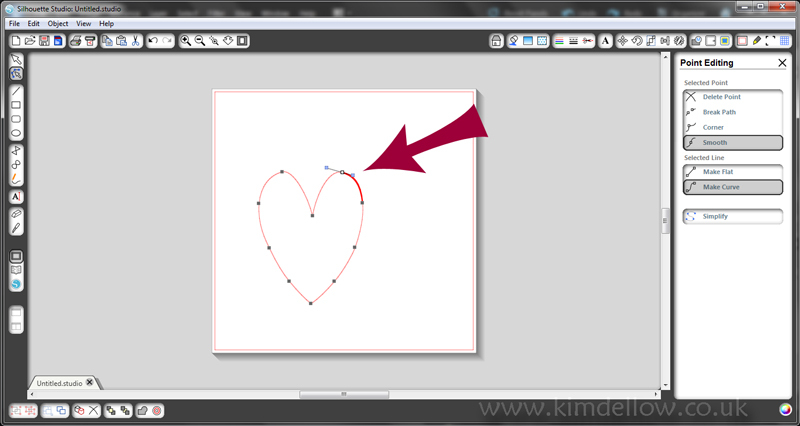 I then change any of the other points on the heart and the line paths until I like the look of the heart. 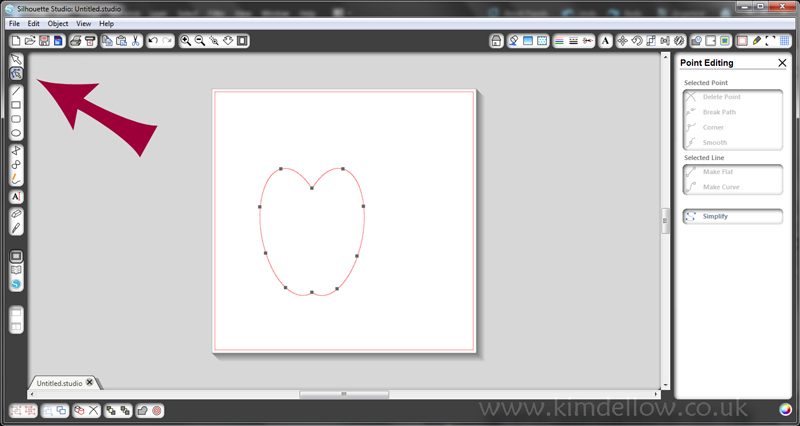 There you have it, a heart, ready to cut in Silhouette Studio. 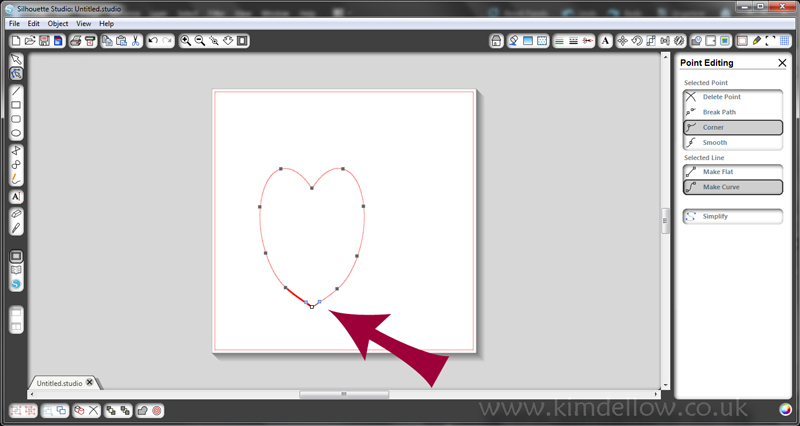 There are different ways to draw hearts, you could try drawing one freehand with the Draw Freehand tool or you could use the method above but use a circle as your starting shape instead of two ellipses. So have fun, play around and see what you can come up with! Do you remember back in April I did a review for the Silhouette Cameo? Wow, was that April already? Where does the time go? 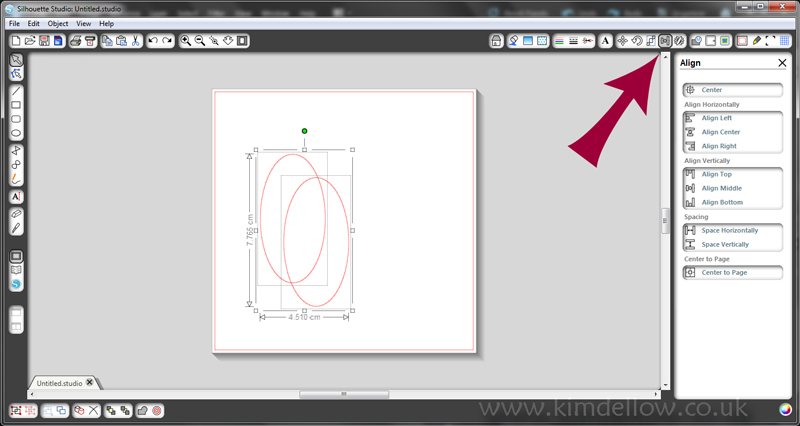 In that review I showed a card, all designed and cut in the Silhouette Studio software. 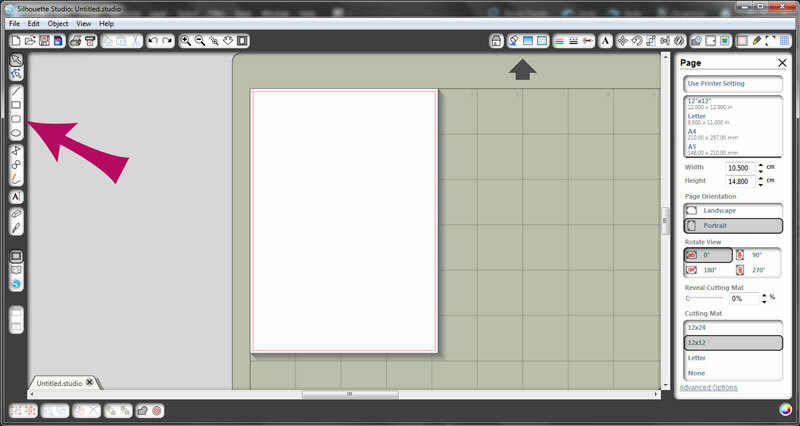 I thought I would show how I made the little mini-tabs in Silhouette Studio, which is the basic software that comes with the cutting machine. 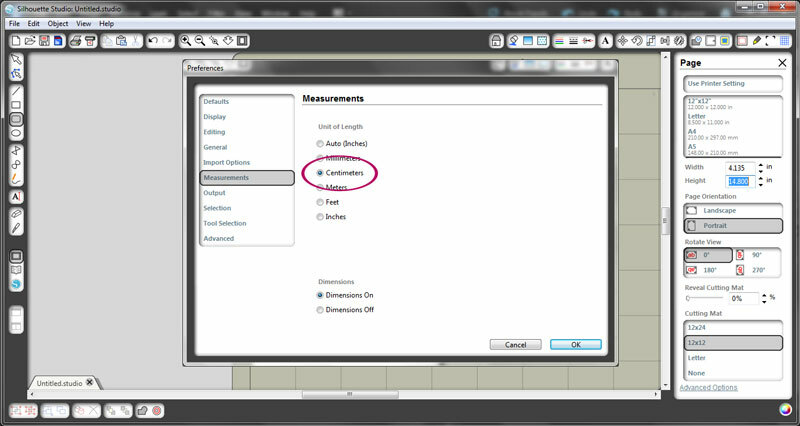 Before we start the software defaults to inches, I don’t mind working in inches but sometimes I just find it easier to work in centimetres, but it is easy to change the software to measure in centimetres. Got to the ‘File’ drop-down menu and choose ‘Preferences’ which is three up from the bottom of the list. I then like to change my design mat to the size of the card I am working on, in this case an A6 (10.5 cm by 14.8 cm), to make it easier to judge the size of the elements. So tap the page option if the ‘Page’ tab isn’t already open and change the width and height. You can always resize it again later if you want. 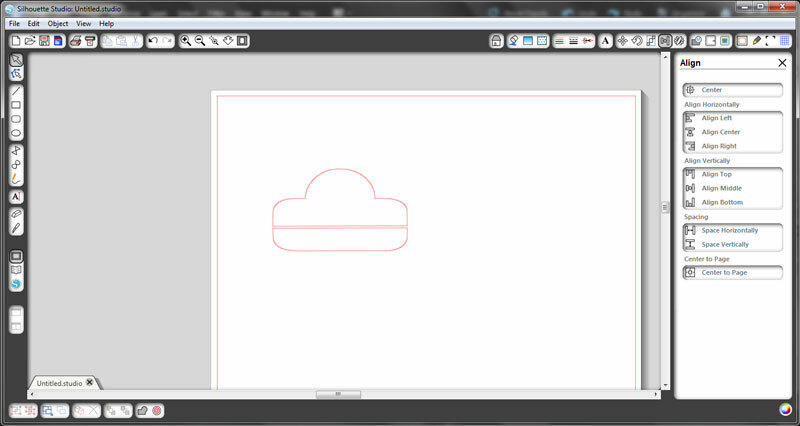 Ok, on with making the mini-tab! 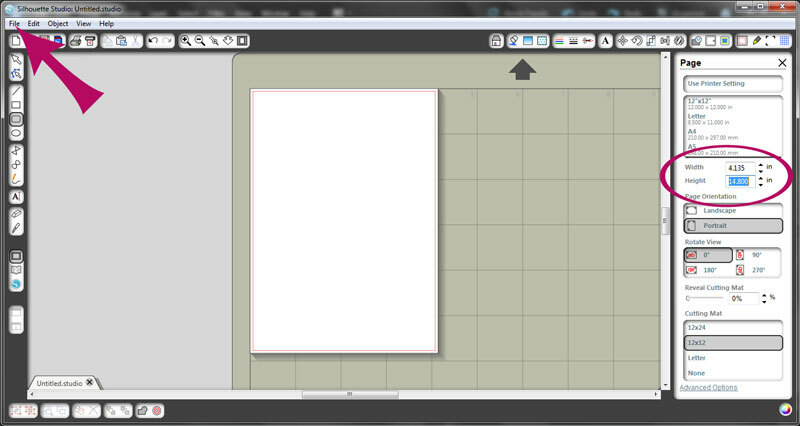 On the left hand-side there are all your line and shapes tools, pick the rounded-corner rectangle (third in that mini-list) and draw a rectangle to the size you want it. then pick the circle and draw a circle. Select both shapes and use the ‘Align’ option to align centre the two shapes relative to each other. 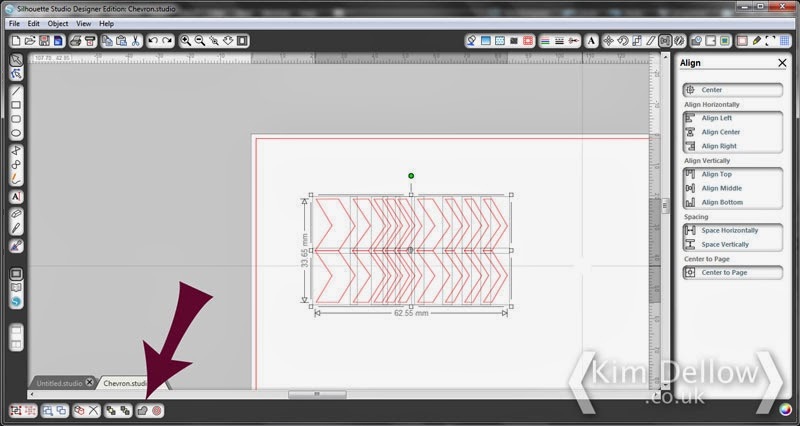 Then pick the ‘Weld’ tool to merge the two shapes into one. Almost there! 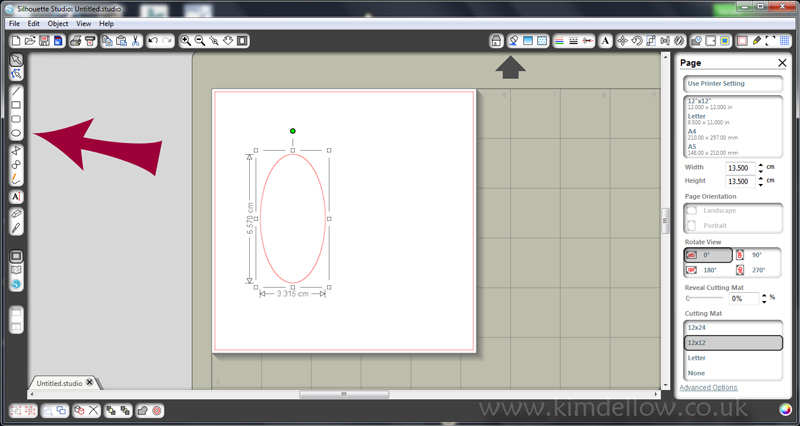 Now it is time to trim the Tab into shape, so pick the ‘Knife’ tool, this is such a cool tool! 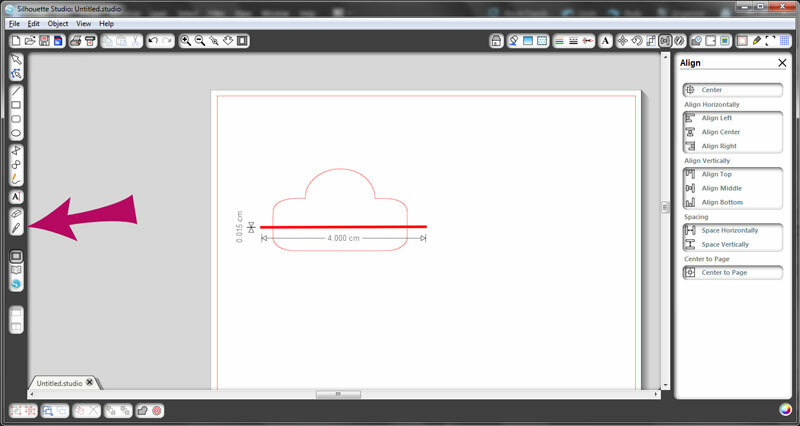 With the ‘Knife’ tool selected, click on the left-hand side of the tab, near the bottom of the shape, hold the button down and stretch the tool over to the right-hand side of the shape. 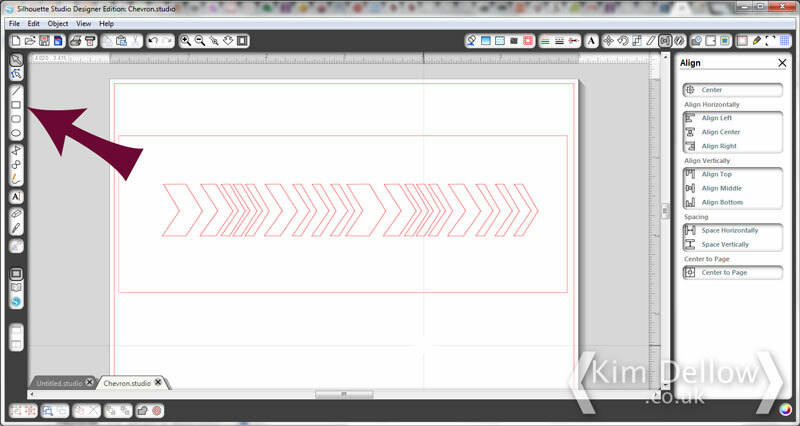 Keep the line horizontal as you drag the cursor across the shape and you have a straight line cut when you release the button. Ta Da! You now have two shapes! 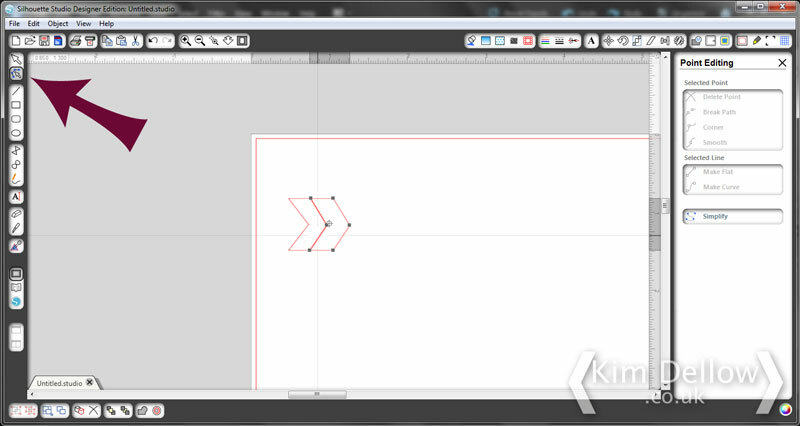 Select the bottom shape and delete it, hitting backspace, or the scissor icon or even using delete in the ‘Edit’ drop-down menu will get rid of it for you. Yay! 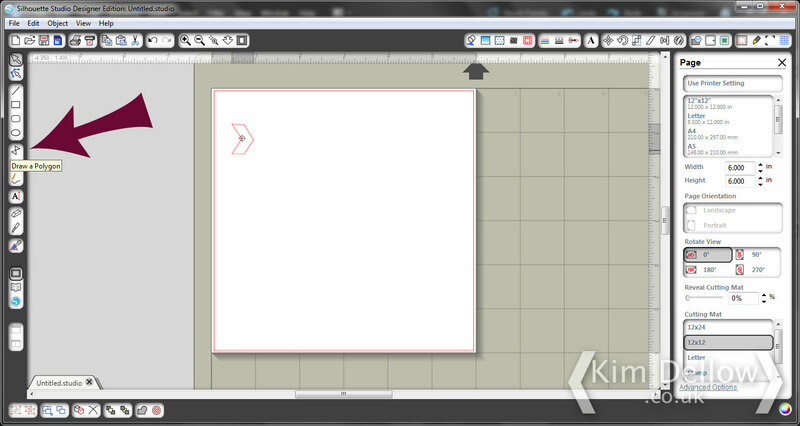 A mini-tab that you can now add a shape to, or some writing, or even leave as it is if you like. Oh and of course you can now cut it out too! Do you remember this make from Saturday? 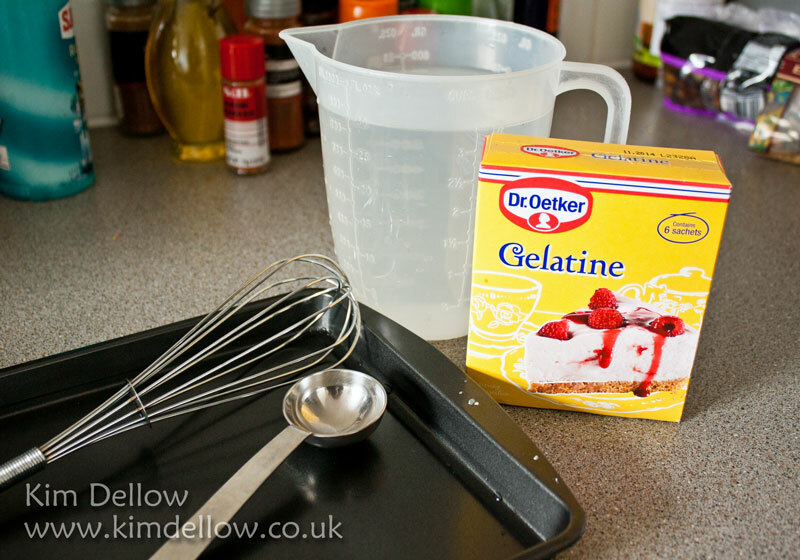 Well I did manage to got my act together and I have a little ‘how-to’ for you in video form. It is my first video so apologies for the top of my head getting in the show at one stage. 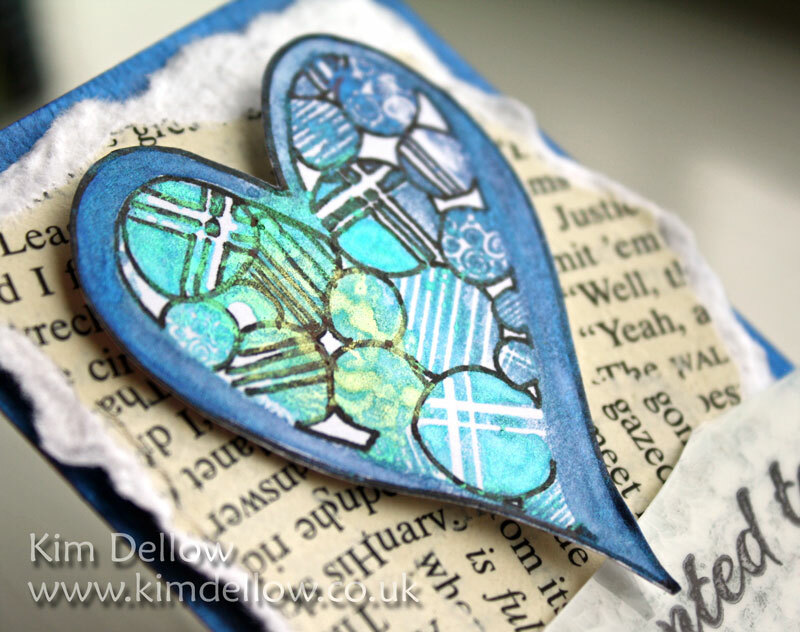 The video shows how I stamped the heart from the Creative Expressions Hearts Entwined stamp set using Cosmic Shimmer watercolour paints as it is quite a fun technique which I thought you might enjoy having a go at, if you haven’t already. If you prefer you can watch it over on my YouTube Channel. Would love to see any makes you have created using this technique so please do come back and link up in the comments so I can pop on by and have a nosy! Don’t forget my current giveaway! 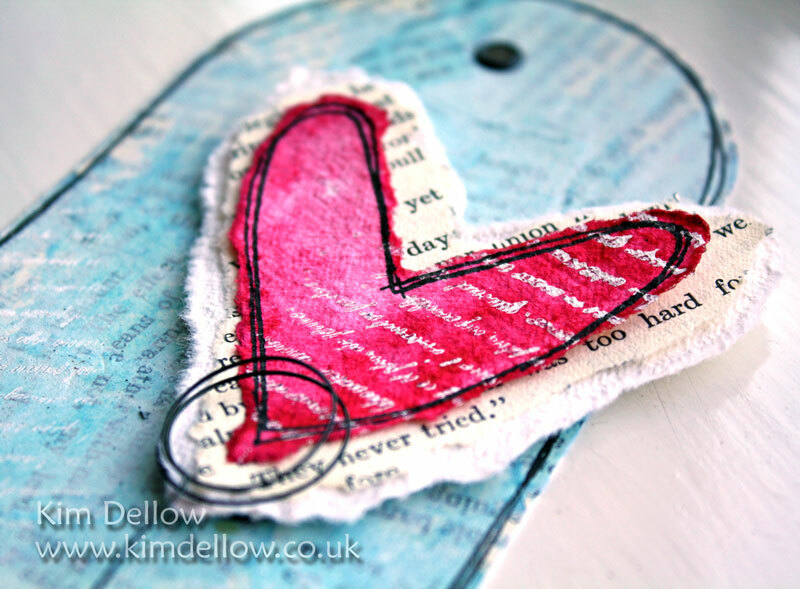 Welcome back to the Craft Stamper February 2013 – Looking Back Blog Hop Event. 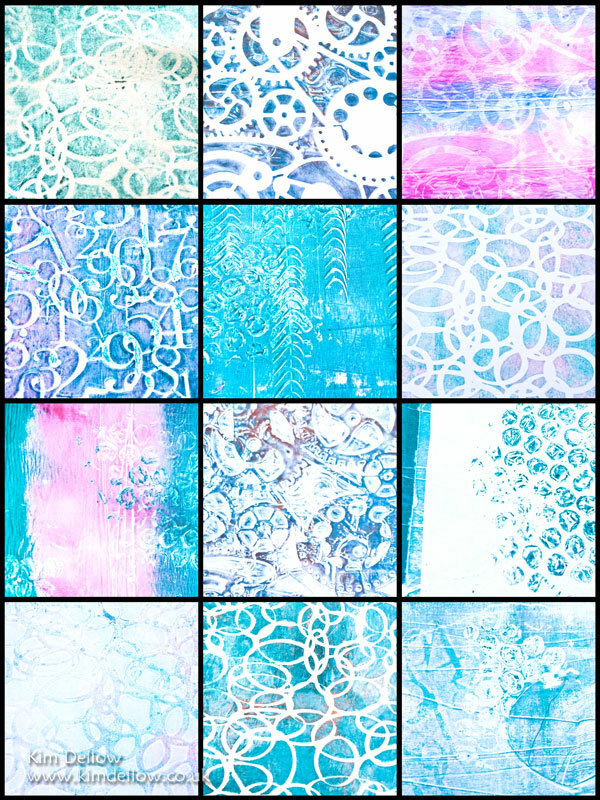 If you haven’t already then check out the blog hop by going to the original Craft Stamper blog post, you still have time to join in for the giveaways, it is open until Midnight 8th February. 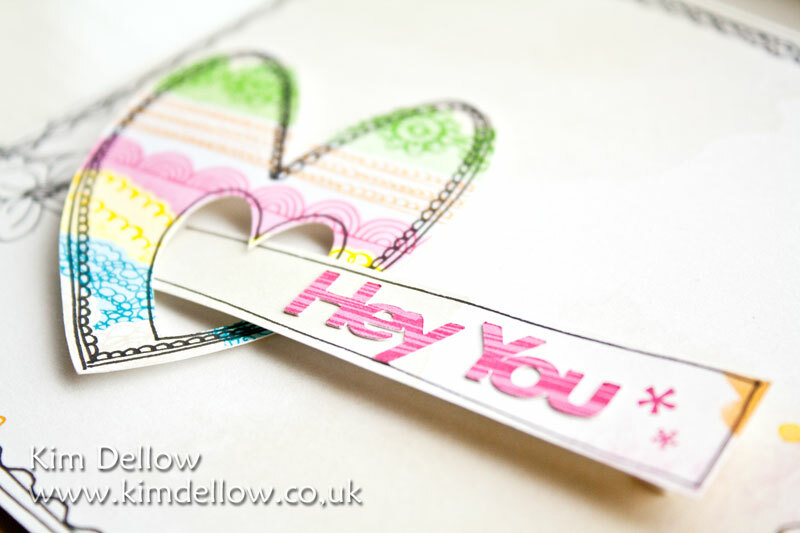 If you have done the hop and are back for my heart tag tutorial then welcome back! Nice to see you! I collaged my card with some book pages using PVA and if you need some tips on how to do it then check out my Collage Background Tutorial. When this was dry I cut my tag shape from a template. A little TIP – I make handy paper templates of all my favourite shapes such as hearts and tags and keep them altogether in a plastic folder for easy reference. 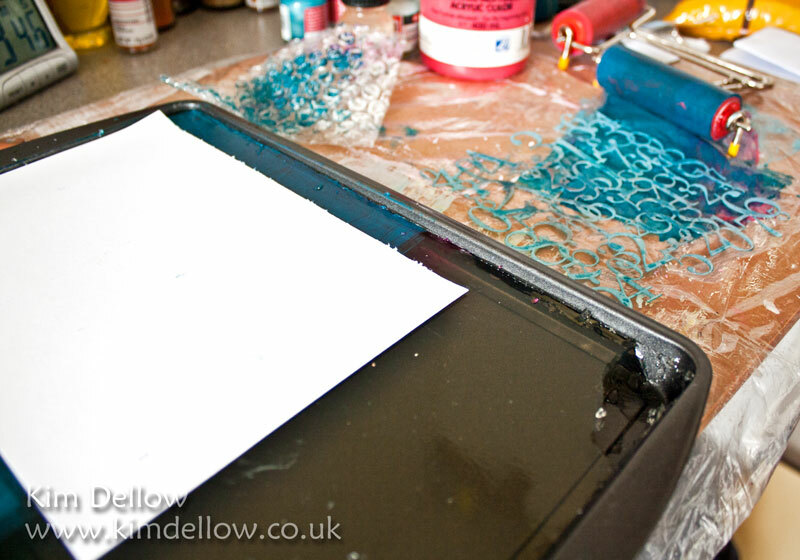 The colouring is a splash of watercolour, I’ve put a pool of water into a dimple palette and added some colour picked up with a wet brush then used a pipette to put droplets of colour onto my plastic sheet covered workspace. I then pressed the tag into the drops a couple of times to pick up the colour and let it dry. A technical term I’m sure! I wanted a little more texture and to soften the colour so added a rough layer of Gesso spread thinly over the tag with a plastic card. 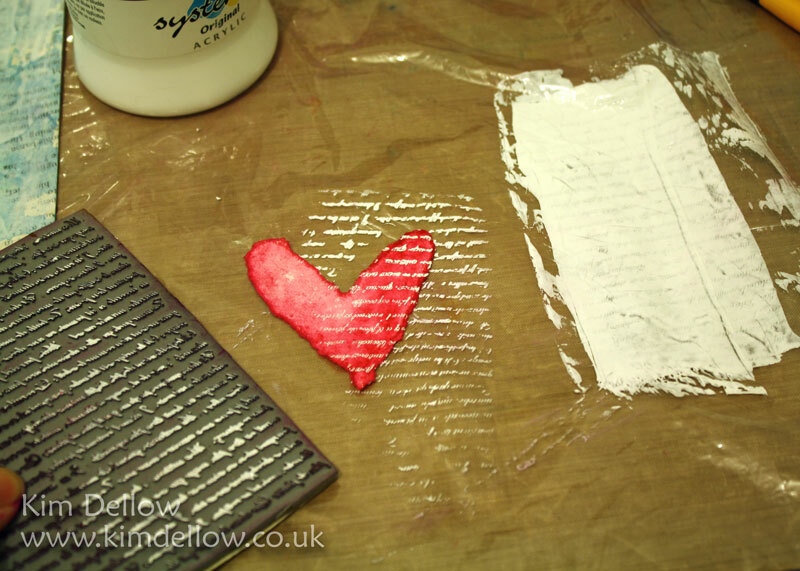 Whilst the Gesso layer was drying I made the hearts. Using another template, this time for a heart shape, I tore three hearts, one from Khadi paper, a slightly bigger one from a book page and then a larger one still from Khadi paper again. The first heart was coloured red with watercolours. 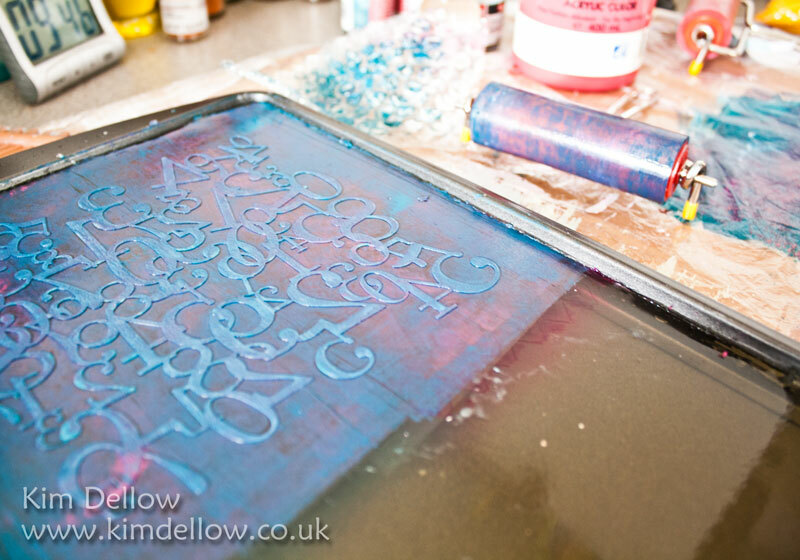 The next step is a little bit of paint stamping, I do love adding stamping details in acrylic paint and Gesso and it is really simple to do. 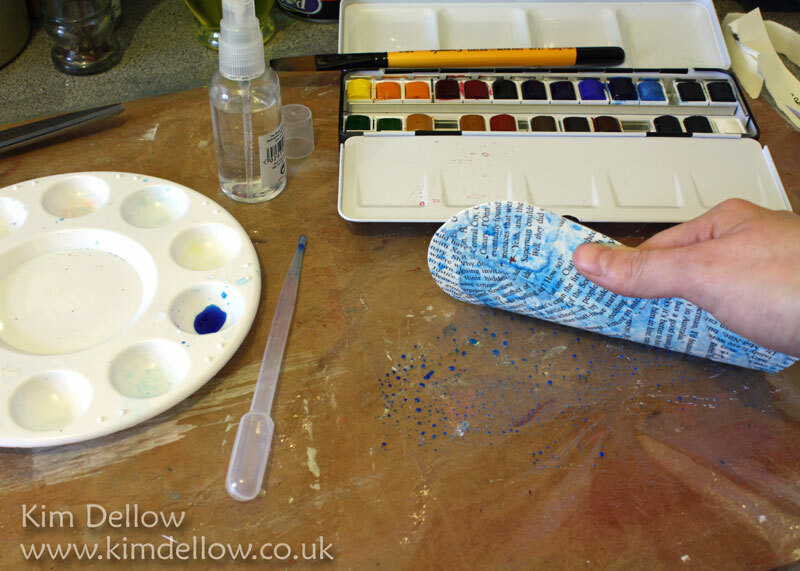 There are different methods but my favourite way is to spread a very thin layer of paint onto a plastic sheet with a palette knife or plastic card and then lightly press the stamp into the layer, then stamp it as normal. 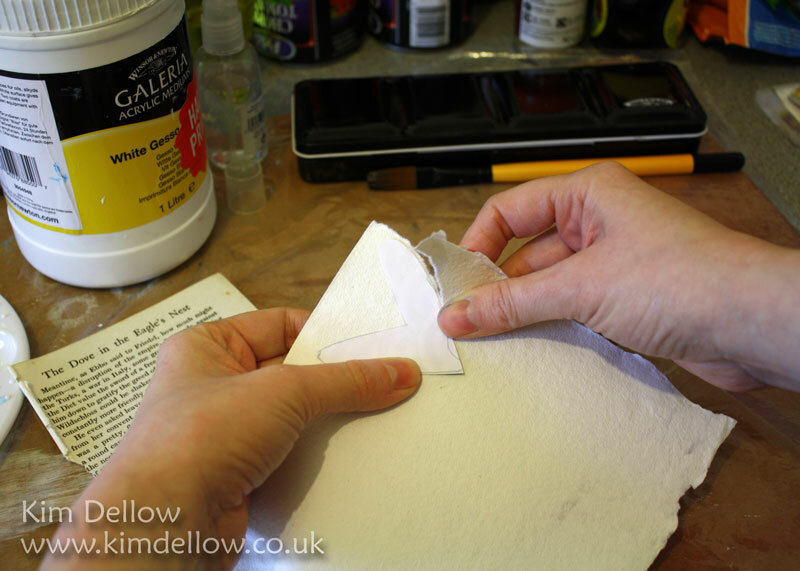 Just remember to dampen or wash your stamp immediately so that the paint or Gesso doesn’t stick. 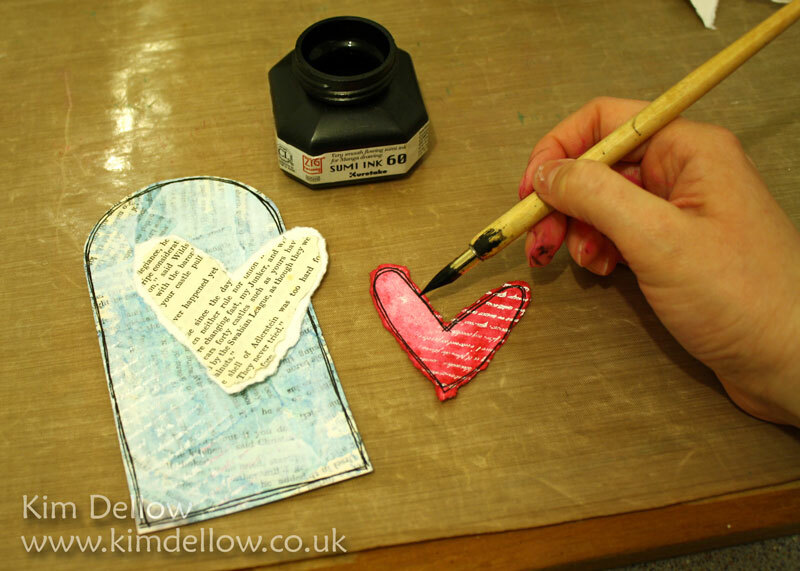 After stamping the coloured heart and the tag it is time to doodle the edges with the dip pen and ink. There is something very immediate and tactile about using dip pens and ink, and I love working with the ZIG Sumi ink as it gives a rich deep black mark. I then layered up the hearts. The final touch was a bit of wire work. I curled some black wire around a thick marker pen and attached it to the heart like a paper clip. I then curled the other end around a thinner pen to attach to the tag. 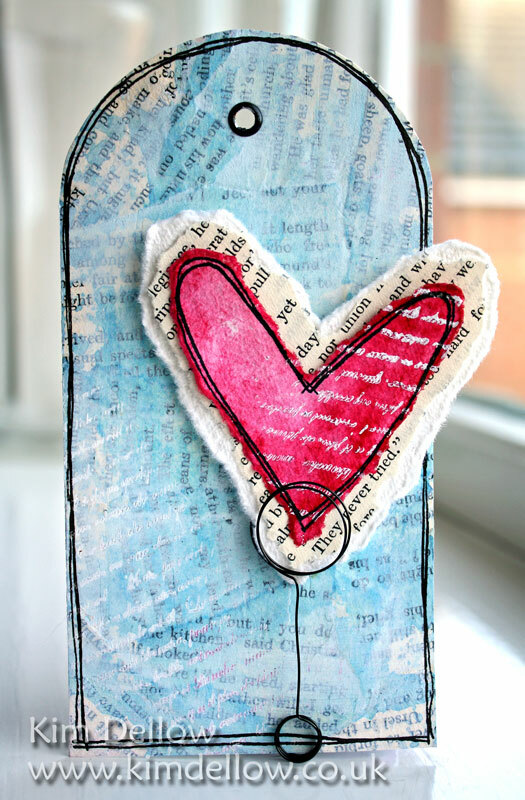 The layered hearts were then held in place with some 3D-foam and an eyelet was added to the tag. There, finished! Or almost; I did think about adding a sentiment but after trying several different sentiments in several different ways, I decided to keep it simple! Hope you have been having fun with the Craft Stamper blog hop and keep your eye out on the blog for more events this week, including more tutorials and a live Q&A on Wednesday with Katy Fox, the Editor of Craft Stamper, over at their Facebook page. All ready for next week? Presents all wrapped? Tree decorated? Food bought? Mmm, nope, me neither! Well the tree is up but the lights have just gone so might have to do some bulb hunting, think I’m going to need a mince pie to help me find the faulty bulb! Got a little notelet card made with the Creative Expressions If The Crown Fits stamp set to share today, it might make a good thank you card to Santa? It only measures 10.5 cm square but the grey card is slightly metallic and has a sheen I can’t quite catch with the camera. I’ve stamped the keys in Ranger Adirondack Slate ink and the sentiment in black. 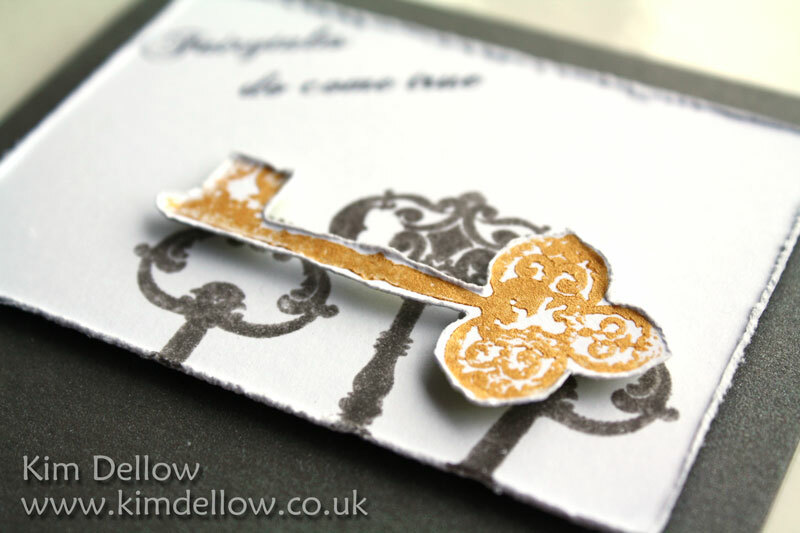 For the focal point key I’ve used one of my favourite techniques and that is acrylic paint stamping. I love this technique because you get a great textured look and also there is a randomness about it that just adds more interest to the final image. 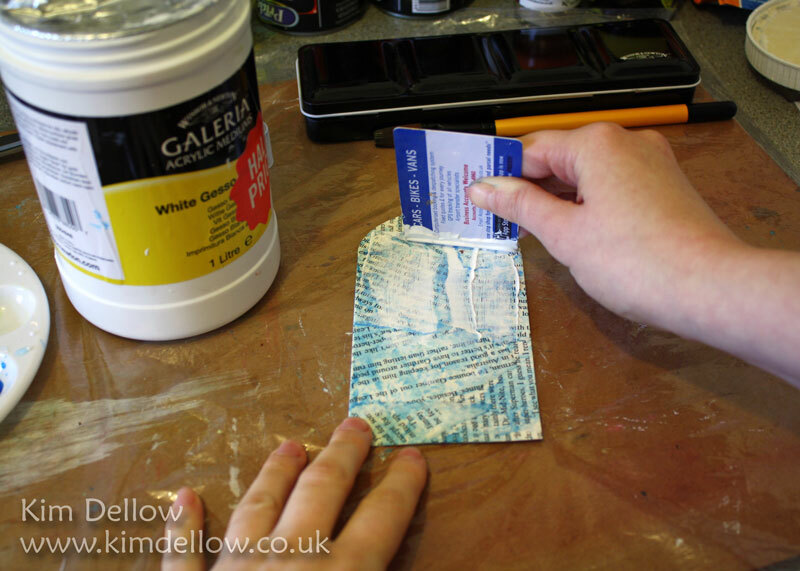 It is easy to do, I usually spread a really thin layer of paint on a piece of plastic (say an old bag) with an old credit card, then lightly drop the stamp into the paint. Peel it up and stamp the image. Just remember to clean the stamp immediately after stamping as the paint is thin enough to dry on the stamp very quickly. Next, I used a seam ripper to distress the edges of the key and the key panel. Then I used 3D-foam to layer up the card. All done! I love the little lion in the centre of the key. Right, I’ve got to go buy some mince pies and Christmas tree light-bulbs! Hope you are all have a fun Friday. Usually I would have a new stamp set to show you for Creative Expressions around about now, but as you probably know Creative Expressions is in the middle of a DT call for the new design team (if you don’t know then why not?! You should go check it out, there is still time to enter!). So in lieu of the new DT I have a technique I’ve been meaning to share with you for a while, so what better time to show it than now? 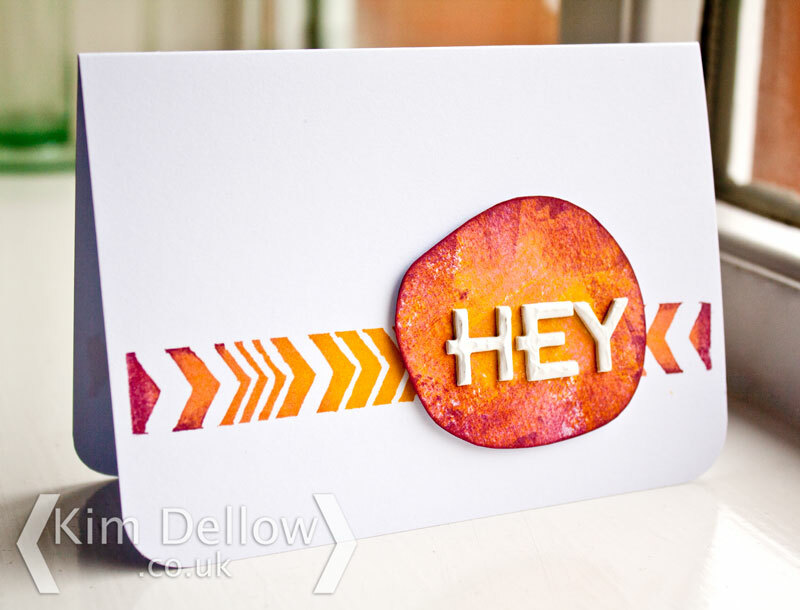 Do you remember this card I made for Creative Expressions using the Gala Event stamp set at the beginning of August? If you look very closely at the stamped image you will notice that not only does it have a pearlescent, almost metalic silver sheen to it, there is a texture to it and indents from the stamping. 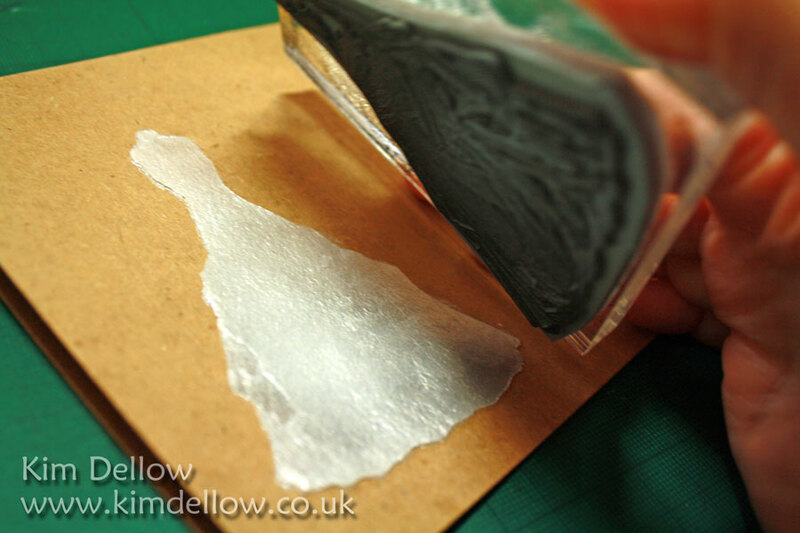 That is because I’ve actually used embossing paste to stamp into and I wanted to share with you how to get this effect. 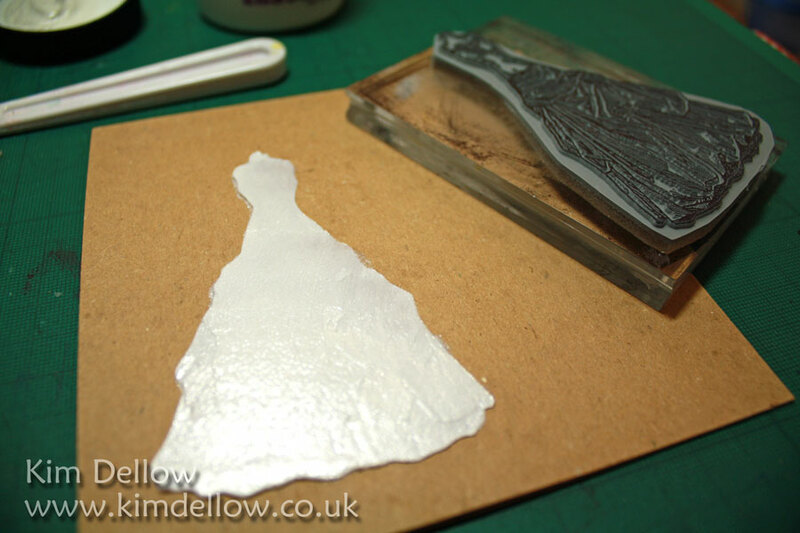 I’ve used the Dreamweaver Stencils Pearlescent Embossing Paste to get the sheen I wanted but you can use any of the many embossing pastes or artist thick/ molding mediums that are on the market, it all depends on what texture and look you want for the finished piece. I’ve tried this technique successfully with the Winsor and Newton Galeria Acrylic Mediums and the Golden Gel Mediums Pastes as well. I’m sure it would also work with the Eco-Friendly Artist Spackle Medium, although I don’t have any to try it, but perhaps one of you guys can report back on it? 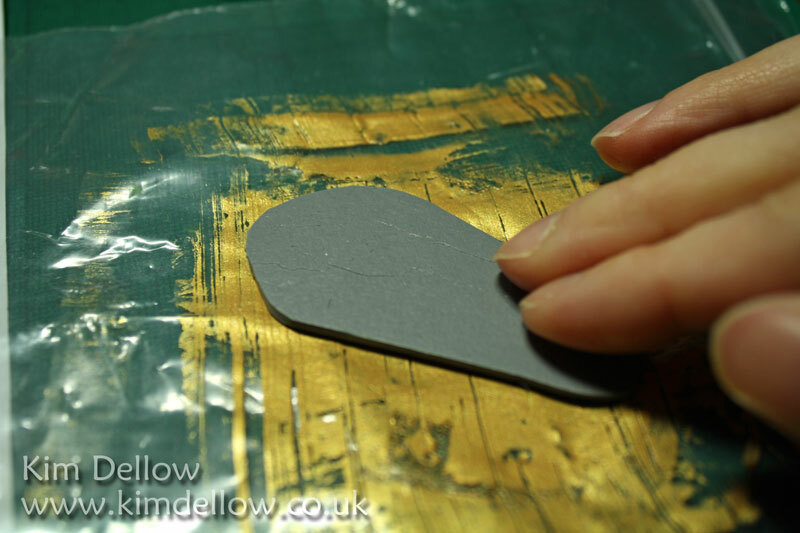 The first thing you want to do is make your own mask using the stamp you want to add the texture to. 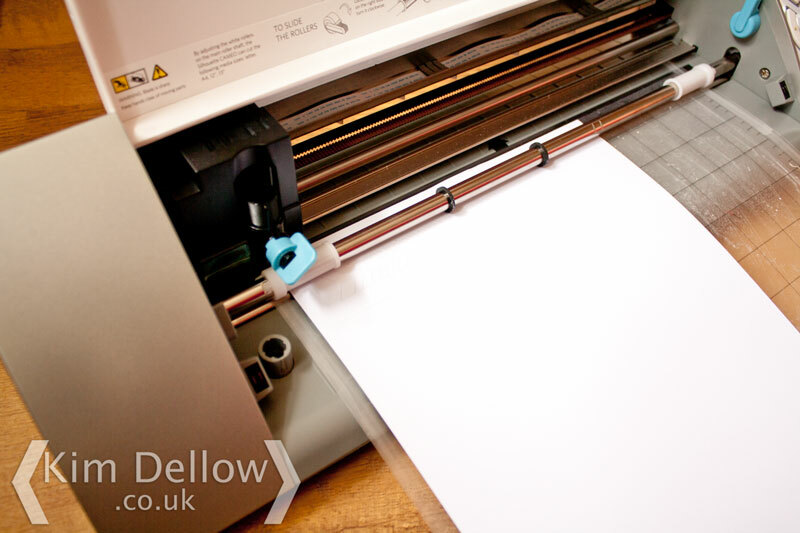 Stamp out the image onto spare paper, I’ve just used ordinary printer/photocopier paper around 80gsm, and use a sharp knife to cut the image out – hey presto – instant template or mask! Place your new mask onto the card front and hold it in place (if you need to you can use masking tape) and use the spatula to spread the paste over the mask. 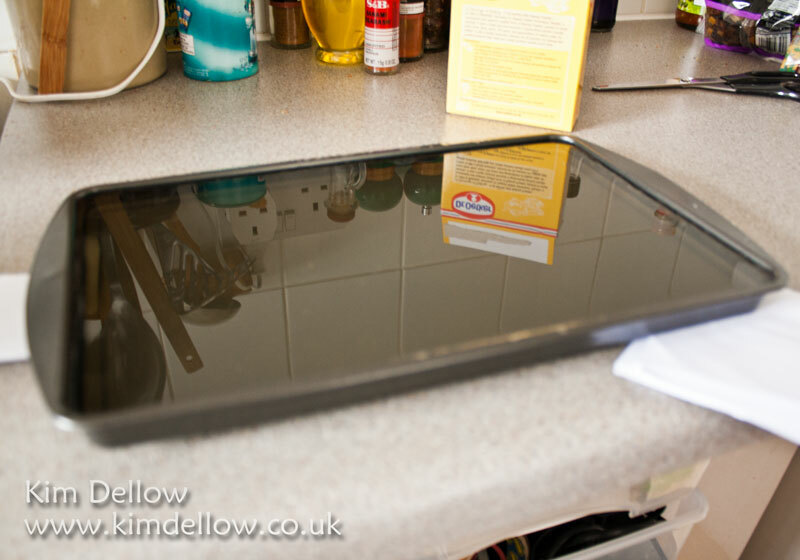 Don’t get too fussy at this stage, the more you work the piece the more likely you are that the paste will spread out to areas you don’t want it. 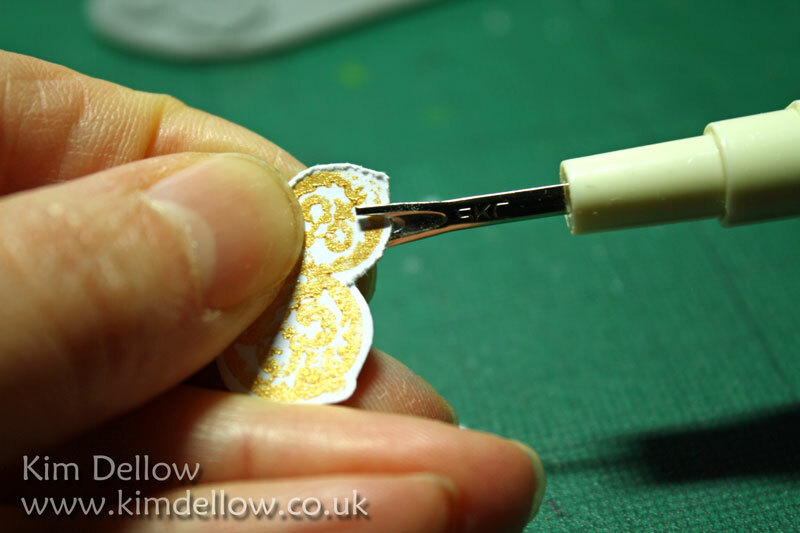 You can always practice on a spare piece of card to work out how much you need to get the thickness you want. 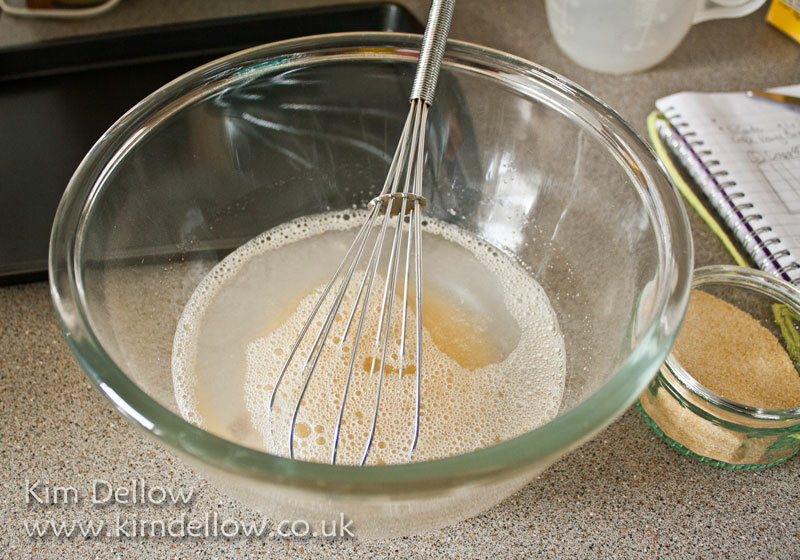 Carefully peal off the mask and let the paste dry so that it is starting to firm up. You want the paste to be wet enough to be able to indent when stamped on but dry enough that it doesn’t spread out when pressed into or leave paste on the stamp. 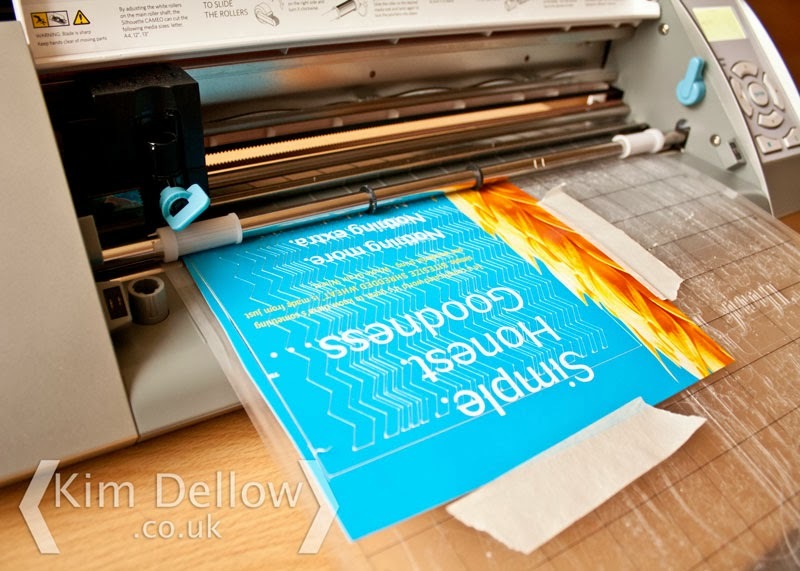 You might need to experiment a bit on spare card to see how long you need to leave it and use the manufactures suggested drying time as a guideline. Ok, now for the tricky bit! Ink up your stamp with the Archival Ink pad and carefully line up the stamp with the paste image and stamp how you would normally stamp an image, press directly down and lift directly up, try not to rock the stamp or let it slip on the paste. 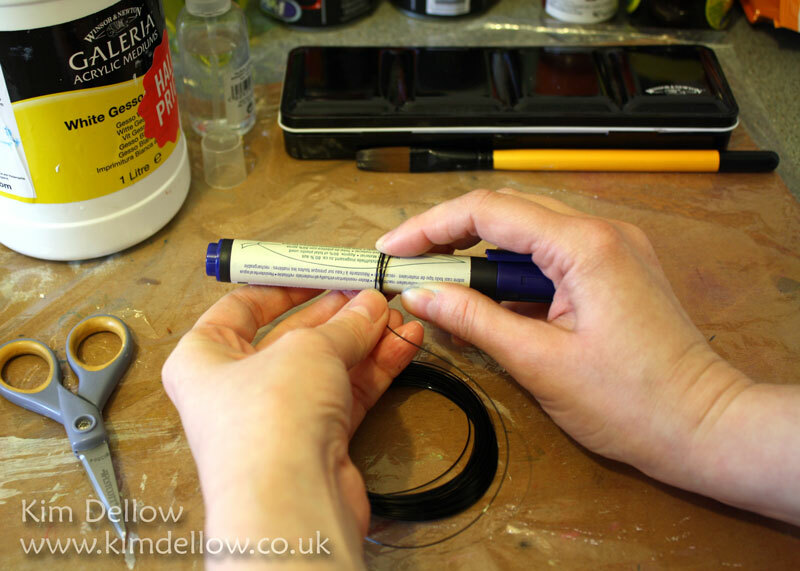 Again there is no harm in practising on a spare bit of paste to get the feel before using it on your final piece. It is hard to get it completely perfect so don’t worry to much about it – it all adds texture and interest to the final project. Hope you have fun giving this a go and let me know how you get on.